Also available as an aran weight or 4 yarn weights patterns. 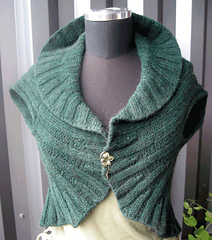 The bulky weight version of the circle vest knits up quickly on size 11 needles for a warm fall or winter vest/shrug. 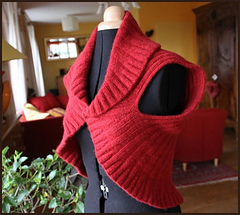 This vest is easy to knit and takes advantage of the stretchiness of ribbing to provide a flattering fit. 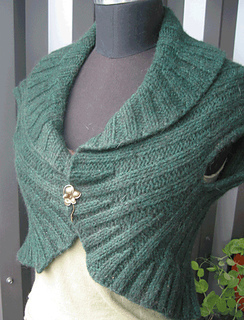 Knit stitches on each side of the ribbing make a built in edge for the armhole. There are two versions: with ruffles and without, depending on how fitted you wish the vest to be. The sample was knit using 3 skeins Cascade 220 Heathers color 9447, knit very loosely then fulled (felted) to end up at a bulky weight (3 st/in) gauge. 32” chest with 16” armholes. For personal use only- for wholesale and artist licenses please see Midnightsky Fibers.